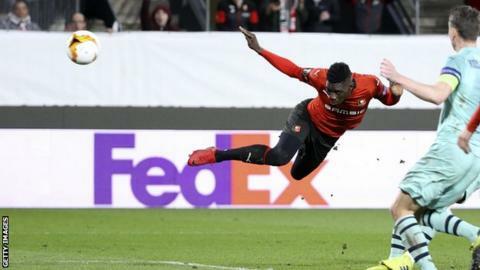 Arsenal manager Unai Emery says he has "confidence" his side can overturn Rennes' 3-1 lead at Emirates Stadium in the second leg of their Europa League last-16 tie. Alex Iwobi's early cross-shot had put Arsenal in front but they lost control of the game after Sokratis Papastathopoulos' dismissal for a second booking. Benjamin Bourigeaud immediately drew the hosts level with a stunning strike into the top right corner, with Nacho Monreal's own goal and Ismaila Sarr's late header compounding a miserable evening for Arsenal. "The red card changed the game more than we wanted," Emery said. "The first 40 minutes we controlled, we scored, we didn't concede good chances. I think we can do better and I have confidence with our players and our supporters helping us." Arsenal go into the second leg having overturned a 1-0 deficit in the last-32 stage. On that occasion, they progressed with a 3-0 home victory over Belarus side Bate Borisov. Arsenal arrived at Roazhon Park having never lost an away game against French opposition. For large parts of the first half, that record looked like remaining intact as they gathered an early lead courtesy of Iwobi and controlled possession. But while Lucas Torreira's effort was superbly saved by Rennes goalkeeper Tomas Koubek and Pierre-Emerick Aubameyang also tested the Czech keeper they proved architects of their own downfall in an 86-second spell. Having already been booked for a foul on Hatem Ben Arfa, Greece defender Papastathopoulos pulled Sarr's shirt to earn his second yellow card, shifting the momentum of the game in the hosts' favour. "A red card can come but after we must learn also to play with one less player," Emery added. "We couldn't do our work in difficult moments, in difficult minutes." With attacking midfielder Henrikh Mkhitaryan operating as a makeshift right-back, Arsenal faced one-way traffic in the second period. Petr Cech, who replaced Bernd Leno in goal, produced a string of superb saves, denying Adrien Hunou, Sarr and Ben Arfa with the score at 1-1. But he was helpless to prevent Rennes' second of the night as the Arsenal defence clocked off and Mehdi Zeffane's cross flicked off Monreal into the top corner. And after carelessly losing possession late on, James Lea Siliki escaped to deliver the perfect ball for an unmarked Sarr to head past Cech at the far post. Until this tie, Rennes' sole experience of English opposition in European competition was an away goals defeat by Aston Villa in the 2001 UEFA Intertoto Cup semi-final. But this unlikely and famous victory over Arsenal has now given Julien Stephan's side, who lie 10th in Ligue 1, a realistic prospect of continuing their most successful campaign in Europe. Despite several previous attempts Rennes had failed to advance beyond the group stage of this competition until this season. But while Emery was able to spend more than £26m on Torreira alone last summer, Stephan's achievements have come with a more modest outlay. Former Newcastle and Paris-St-Germain forward Ben Arfa, who tormented Mkhitaryan at times, arrived on a free, while ex-Lyon midfielder Clement Grenier, who has five caps for France, hardly put a foot wrong in midfield with a 90% pass accuracy. There were also signs that Sarr, who has been linked with Barcelona, could prove a handful in the return leg at Emirates Stadium. The 21-year-old constantly tested Monreal for pace, skipping away from him on several occasions and had three efforts on goal before getting his reward at the death. Rennes are unbeaten in five games in Europe (W4 D1), their longest-ever run without defeat in European competition. Arsenal have lost consecutive away games in Europe for the first time since 2015, when they lost to Dinamo Zagreb in September and Bayern Munich in November in the Champions League. The Gunners have conceded three (or more) goals for the first time in 23 European games, since losing 5-1 to Bayern Munich in March 2017 in the Champions League. Arsenal have picked up red cards in consecutive games (v Rennes and Tottenham) for the first time since September 2015 (v Chelsea and Dinamo Zagreb). They have had a player sent off and scored an own goal in the same game for the first time since September 2015 (v Chelsea in the Premier League). Petr Cech returned to Roazhon Park with Arsenal, 14 years and 288 days after making his last club appearance there as a Rennes player in May 2004. Alex Iwobi has scored five goals for Arsenal in all competitions this season - his best return in a single campaign for the club. Iwobi's opener, after exactly three minutes, was Arsenal's fastest goal in European football since Lukas Podolski scored in the Champions League (after two minutes one second) against Galatasaray in December 2014. Rennes striker Ismalia Sarr has been directly involved in six goals in the Europa League this season (four goals, two assists), more than any other player for the French side. Arsenal resume their Premier League duties when Manchester United visit Emirates Stadium on Sunday (16:30 GMT). They then host Rennes in the second leg of their Europa League last-16 tie on Thursday 14 March (20:00 GMT). Rennes face Caen in Ligue 1 on Sunday (16:00 GMT) before travelling to London.